Fuel economy means something to everyone these days. But for truck and RVers, it means everything as prices at the pumps are nearing $1.40/litre. 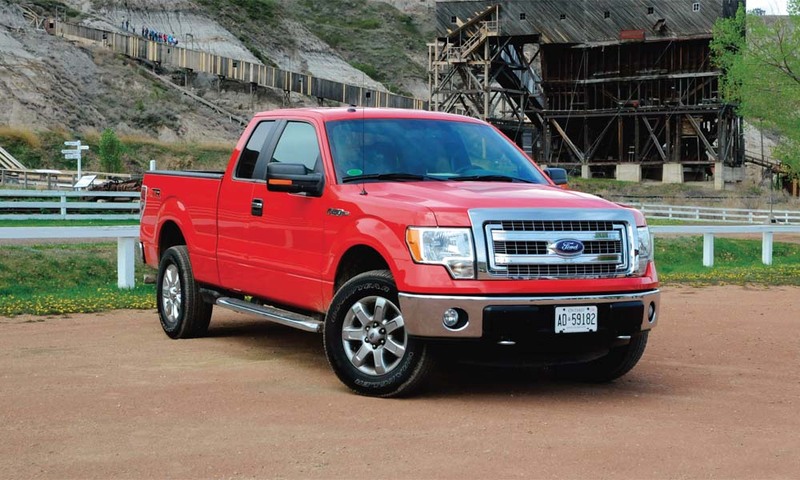 To meet this common dilemma, Ford continues its quest to provide RVers with improved, reasonable fuel economy with the 2013 F-150 Limited and its fuel-sipping EcoBoost engine. On a recent test of the F-150 Limited in Drumheller, AB., we measured 9L/100 km, a 20 percent increase over last year. The F-150 Limited is powered exclusively by this ground-breaking 3.5- litre Ti-VCT powerhouse, which produces 365 horsepower on regular fuel and up to 90 percent of the peak 420 lb-ft of torque available from 1700 rpm up to 5000 rpm. This flat torque curve is extremely important for RVers towing a trailer. The fuel economy improvements are accomplished with the use of twin independent variable camshaft timing. Ford’s latest patented achievement also delivers an unmatched combination of best-in-class towing and payload, torque and fuel economy. The F-150 owns the maximum towing capacity honor as well. The 3.5- litre EcoBoost and 6.2-litre V8 are rated to tow up to 11,300 pounds using a 4.10 rear axle ratio. Tow ratings have been increased this year, even though the truck is still the same mechanically as 2012. By conducting independent testing procedures, Ford engineers demonstrated the F-150 is capable of handling greater trailer loads. In fact, the company chose not to implement the new J2807 towing specifications for 2013 as the truck is not a completely new model. The F-150 EcoBoost 3.5L engine, sixspeed transmission, 4×4 Platinum model in Tuxedo Black with black interior and Pecan leather upholstery. Electronic lock 3.31 rear axle, 7,200-pound GVWR, priced at $63,509. A Race Red F-150 SuperCab with a 3.7L V6 FFV engine, 3.73 rear axle ratio, 8,900 GVWR, priced at $44,504. The F-150 Ingot Silver metallic with a black leather interior, 5.0L V8 FFV engine, 3.56 axle, luxury package, priced at 55,108. 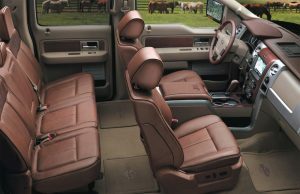 A F-150 King Ranch, 55.0L V8 FFV engine, 3.56 electronic lock axle, two tone paint, 7,350 pound GVWR, $64,599. The F-150 Limited brings uncompromised capability with an electronic six-speed automatic transmission and tow/haul mode, trailer tow package, integrated trailer brake controller, reverse sensing system, power-deployable running boards and a 110-volt power inverter. During our testing, we towed a construction trailer loaded with a bobcat earth mover for a total weight of 10,000 pounds. The 3.5 L Eco-Boost engine handled the extra weight of the trailer with very little effort. The transmission stayed in drive mode without downshifting on eight-percent grades. 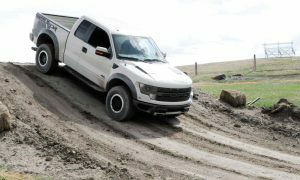 Even on severe downgrades like the long descent from the Rodeo Grounds on Highway 9 to the town limits of Drumheller, the F150 held the load in complete control even past the runaway ramps so often found in the mountain roads. The Trailer Sway Control feature is important to RVers and simply operates by applying precise braking or reducing the engine torque to help bring both vehicle and trailer under control. The system uses the vehicle’s existing stability control system, which includes wheel speed, throttle position, steering wheel angle sensors, yaw rate, lateral acceleration sensors, and a gyroscopic roll rate sensor that all combines to reduce trailer sway. When the system detects the trailer yawing in one direction, it applies selective brake pressure on the vehicle’s opposite side. This dampens the yaw motion and helps to reduce the sway when the trailer tries to push the tow vehicle. It is designed to operate seamlessly and help the tow vehicle decelerate gradually. It works even when trailers have no braking systems, frequently the case when you are towing a boat trailer or a small camping trailer. Trailer sway happens above a critical speed, which is different for each vehicle- trailer combination depending on the type of trailer, how it is loaded, and other key factors. Trailer sway often occurs due to gusty wind conditions when you are coming out of a rock cut in the highway, being passed by a large semi-truck or when you need to quickly avoid debris on the roadway. Uneven loads or poorly distributed loads are often to blame. The combination of the trailer and tow vehicle must be level for the proper transfer of hitch weight. When a large percentage of the trailer weight is on the hitch, it has a tendency to transfer the weight away from the tow vehicle’s front wheels, making it more difficult to steer. Sway most often becomes a problem when you are going downhill as there is too much weight in the back of the trailer and it pushes against the tow vehicle. The F-150 Limited is available exclusively with a SuperCrew four-door cab configuration and has unique 22-inch polished aluminum wheels and the power-sliding rear window features privacy tint and defrost functionality. Its exterior design has body-colour front and rear bumpers, front bumper valance, sideview mirror caps, wheel-lip molding, upper fascia and grille surround and is available in three colours– Ruby Red Metallic, Tinted Clearcoat, Tuxedo Black Metallic and White Platinum Metallic Tri-Coat. The HID (High Intensity Discharge) headlamps deliver two and a half times more light than conventional halogen lamps allowing you so see farther ahead so that you can have more reaction time. The interior of the Limited has rich red and black full-grain leather-trimmed seats for the driver who desires a high-end appearance and functionality. The head restraints are four-wayadjustable and the seats offer cooling and heating with memory functionality to remember seating preferences for two different drivers. A standard moon-roof provides a view of the sky, while the rear view camera, mounted in the lower edge of the Ford nameplate on the tailgate, is a boon for drivers when backing, maneuvering or while hooking up their trailer. PowerFold side mirrors keep warm and dry in inclement weather and help ensure driver visibility with heated glass, memory position functionality, puddle lamps, turn signals and self-dimming actuation. More and more customers today have high expectations of luxury and convenience, yet their needs call for a truly capable truck. Today’s truck buyers want All-Wheel Drive, Value, Fuel economy, and towing ability. Ford has raised the bar for the driver and passengers to be connected with Ford MyTouch powered by SYNC. Since many owners use their truck as a mobile office, the controls for the sound system and climate controls are easily operated – even while wearing work gloves. The Limited’s dash has a cluster design with a 4.2-inch driverprogrammable screen that can be customized to monitor various vehicle systems. The powerful Sony Audio System comes standard with AM/FM/SAT radio and includes a media hub with USB ports, an SD-card reader and RCA video input jacks. Following our test, it’s clear that the F150 Limited meets the growing luxurious needs of owners who want to differentiate themselves from other high-end options currently available on the market. Is Your Tow Vehicle Working Too Hard?